A U.S. Air Force B-52 bomber flies over Osan Air Base in Pyeongtaek, South Korea, Jan. 10, 2016. The U.S. flew two B-52 bombers over the South China Sea Tuesday to discourage China from militarizing the Spratly archipelago. U.S. B-52 bombers sent over the disputed South China Sea this week will, for lack of a broader foreign policy, fall short of empowering smaller countries to resist China’s maritime sovereignty claims, analysts say. The U.S. Air Force flew two bombers Tuesday from a base in the Indian Ocean to near the South China Sea’s Spratly Islands, the Air Force Times online reported. That movement followed seven passages of U.S. naval vessels through the same sea since President Donald Trump took office in 2017. 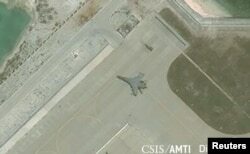 Satellite imagery shows the deployment of several new weapons systems, including a J-11 combat aircraft, at China’s base on Woody Island in the Paracels, South China Sea, May 12, 2018. China calls the entire 3.5 million-square-kilometer sea its own despite rival claims by Brunei, Malaysia, the Philippines, Taiwan and Vietnam. The U.S. military movement will pester China without emboldening other countries, all with smaller armed forces than the People’s Liberation Army, unless Washington offers the others more naval cooperation or diplomatic and economic support, scholars believe. “We should certainly expect an increase in U.S. operations meant to show that (Washington) doesn’t recognize China’s unilateral restrictions on waters and airspace around the South China Sea,” said Gregory Poling, director of the Asia Maritime Transparency Initiative under the American think tank Center for Strategic and International Studies. “But that will only help the regional claimants if it’s part of a larger U.S. strategy, which so far it hasn’t been,” Poling said. Construction is shown on Fiery Cross Reef in the Spratly Islands, the disputed South China Sea, in this June 16, 2017, satellite image released by CSIS Asia Maritime Transparency Initiative at the Center for Strategic and International Studies. 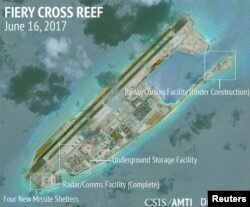 The U.S. B-52 flyover followed years of reports that China had built military installations on three Spratly islets and at least one in the sea’s Paracel chain. China has landed military aircraft and deployed missiles, according to some media reports. A Chinese foreign ministry spokesperson said Wednesday her country was not afraid of the bombers. China cites historical records to back its claim to about 90 percent of the sea that stretches from Hong Kong to Borneo. Other countries have not publicly leveraged the U.S. moves to advance their own maritime claims, though they resent China’s increased activity from military buildup to increased coast guard presence and annual fishing moratoriums. Taiwan’s foreign ministry noted this week a strengthening of its relations with the United States in 2018 to date but did not indicate whether the B-52s or U.S. naval movement in the sea would play in its favor. Taiwan holds the largest Spratly feature, Taiping Island. 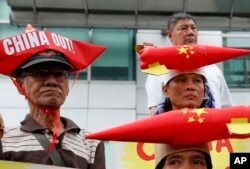 Protesters, wearing boat-shaped paper hats and mock missiles, join others in a rally at the Chinese Consulate to protest China's alleged continued militarization of the disputed islands in the South China Sea known as Spratlys, Feb. 10, 2018. But President Rodrigo Duterte opposes reliance on the Philippines’ former colonizer, the United States. He set aside the maritime sovereignty issue in 2016 to push for economic ties with China. “There could be a greater assertiveness on the part of some of the claimants like Vietnam for the U.S. to play a greater role and for some groups in the Philippines to actually maybe pressure the government to at least be more assertive diplomatically,” Atienza said. China and the Philippines faced off for four years over Scarborough Shoal, which lies within Manila’s exclusive economic zone but was occupied by Beijing’s ships in 2012. More confidence in the United States as a defender against China would come from tighter military and even trade cooperation in Southeast Asia, analysts say. Washington needs a “robust diplomatic strategy to isolate China” including economic measures, according to Poling.